Your reservation is for the Guest Suite at Hale Kai Ewa. It has two bedrooms with queen beds and a den where up to 2 children are free. Your private entrance to this beachfront home on Ewa Beach Road has a full-sized kitchen for your personal use. You don't even share the wash and dryer, but you'll find laundry soap and dryer sheets in the drawer, where they're supposed to be. Great for 4 adults and 2 children. Ewa Beach Road has a small, sleepy beach-town atmosphere. Watch endangered birds, sealife, and flora from the lawn or sit with the sandcrabs on the beach. 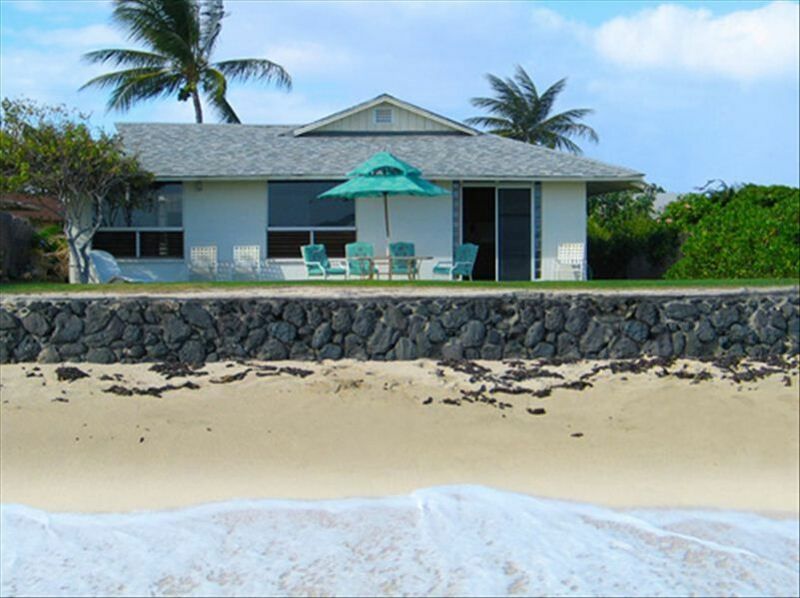 Spend quality family time tucked away in a well-furnished, traditional, beachfront home on sunny Ewa Beach Road with the convenience of shopping centers, banks, restaurants (personal favorite is Russo's coal-fired pizzas), and Hoakalei Resort just a mile away. Need help, I'm not far away. Come to the back of the house to find me or my son is just a few more steps away. Got any questions, please don't hesitate to ask. Hope to see you soon! Gosh, this is an old picture of me. I used to enjoy pole fishing, and in 2004, my friend talked me into accompanying him on a fishing trip in his 16-foot boat. Dinner was great. Today, at 74, my interests are in rescue work with handicapped birds, a few rescued dogs, and learning to age gracefully on Ewa Beach Road. You are on the beach at Ewa Beach with the best view on the island. You can walk miles of natural shoreline. The weather in Ewa Beach is wonderful. The surf is gentle and the water is safe. Songs have been sung for decades about the Ewa Moon and our pearly shells. This is nature at its best. toilet, combination tub/shower, Private bathroom for master bedroom. toilet, combination tub/shower, Roomy countertop and long towel rack for Bedrooms 2 and 3. 85-gallon, solar-heated water heater with anti-scald governor for the shower. Very near to the ocean, so you can watch the rising of our sea waters as it will sometimes wash over the lawn.during King Tides. White sandy beach then the coral reef. There is a nice swimming hole about swimming pool size with a sandy bottom. A view of Waikiki, Ala Moana, Pearl Harbor, and HNL to the east and the Pacific Ocean to the South. To the west toward Waianae, you can see a bit of the rest of the south west shore of Mamala Bay..
Open view of the Pacific Ocean, looking toward the South Pacific Ocean. Waves are 1-8 feet, but average 2-3 feet. Bedjet climate control on queen beds. Extra linen and blankets in the closet. 24 cu. ft. to accommodate your drinks, snacks, and preps for the BBQ. Ceiling fan right above the table. Warning: The kitchen faucet water temperature is not regulated. The water heater is solar heated and can get very hot in the summer. Books for all ages and paper backs to take with you. Board games and tactile games for children and rainy day activities. We have a lot--a lot--of videos and a cd player. The porch runs the width of the house, is about 10 feet wide, and has a table for 6, a lounge chair, and play equipment. Patio runs the width of the house. Boogie boards and sand toys are in the shed. Surf boards can be rented from Kapolei at $75 for 3 days. There are a couple of tennis courts within 5 miles of our house. Bring your golf clubs if you want to play. We have a number of courses in our area. Catering can be arranged with D'lish by the Sea at Iroquois Point. When booking by the week, housekeeping is on a weekly basis at no additional cost. Golfing, Pearl Harbor Arizona Memorial, Water Slide, Ewa Train Ride, , Waipahu Plantation Town, Hiking trails, Westlock Shoreline Park, Botanical Gardens and Beach Parks. Ku'ilioloa Heiau: It stands at the end of Kane'ilio Point. The Hawaiians used this heiau (sacred place) for navigation. It is the only heiau that is bordered on 3 sides by water. .